Currently, only firearms dealers with a federal firearms license (FFL) can access the National Instant Checks System (NICS) to perform background checks on firearms purchases/transfers. The Virginia State Police cannot access the system on behalf of private citizens selling or transferring firearms. This bill would give the Virginia State Police statutory authority to perform background checks on behalf of private citizens at firearms shows, which is required by the FBI. Private sellers feel it is their civic duty to obtain the results of a background check prior to selling or transferring a firearm and they currently do not have the ability to access background checks for this purpose. This would allow them access on voluntary cases. This bill requires the Virginia State Police to be present at every firearms show in the Commonwealth to perform background checks on a voluntary basis. Currently, a person subject to a protective order is prohibited from purchasing or transporting a firearm, but not from possessing a firearm. This bill would prohibit a person subject to a permanent protective order from possessing a firearm for the duration of the order. Permanent protective orders are issued by a judge and are served to the subject. They can last up to 2 years and can be extended by the judge as necessary. This bill allows the subject of the protective order 24 hours to transfer or sell the firearm to a non-prohibited person. The subject of the protective order may possess or transport the firearm during that 24-hour period only for the purposes of selling or transferring the firearm. If a person violates this section, they could be guilty of a class 6 felony. Reciprocity for all states with a concealed carry permitting process. Prevents state-shopping. If a person has ever been revoked in Virginia, they cannot go to another state to get a permit and have that permit be recognized in Virginia. Retains the 24-hour verification clause for law enforcement purposes which allows the VSP or other law enforcement agencies to verify the validity of a permit for an out-of-state person 24 hours a day when states that offer that process. Permit-holders must carry another valid state-issued ID for the purpose of verification. Governor McAuliffe will also extend the effective date for the planned implementation of the revocation of reciprocity agreements with other states to March 1st. Republican State Sen. Bryce Reeves said, “I am happy to have been able to work with my colleagues to reach agreement on this deal today, which includes protecting the rights of 421,000 Virginians who hold concealed carry handgun permits,” while Democratic Delegate Kathleen Murphy added she was happy to find “common ground” with Republicans that will help reduce gun violence. Some might not agree with the concessions, especially since pro-gun lawmakers were gathering enough votes to override an expected McAuliffe veto on the proposed total recognition legislation this session. The original bill would have honored valid carry permits from individuals who are at least 21 years of age from other states. Also, it would “further require the attorney general to enter into a reciprocity agreement with any state that requires an agreement in order to recognize Virginia concealed handgun permits.” This is what the National Rifle Association was going to work on with Virginia lawmakers. At the same time, most of these provisions fall within existing federal law, or are heavily supported by law-abiding gun owners. As Bob Owens at our sister site Bearing Arms noted, the protective order portion isn’t a major concession. “It was very much a minor concession in line with what most Republicans support. No one wants an violent abuser to have access to firearms,” he wrote. Gun-safety activists reacted with fury on Friday to a deal Gov. 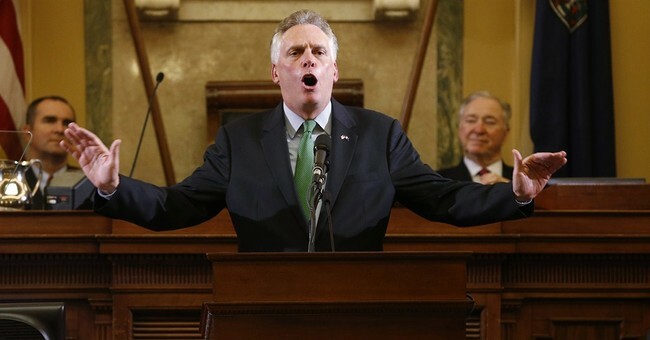 Terry McAuliffe struck with Republicans to recognize most out-of-state concealed-handgun permits, fanning out across the Capitol, placing hundreds of calls and writing to the Democrat who won office two years ago bragging about his “F” rating from the National Rifle Association. “Governor McAuliffe should reconsider this dangerous gift to the gun lobby,” said John Feinblatt, president of Everytown for Gun Safety, which in the fall poured more than $2 million into two state Senate races in a failed attempt to help McAuliffe’s party take control of the chamber. While the NRA has praised the deal, gun-safety advocates who just last week rallied on Capitol Square with the governor described it as a betrayal. Yes, it is a bit awkward given that these gun control advocates rallied in support of Herring’s actions on January 18. Nevertheless, what was announced today was very much in line with what VCDL president Philip Van Cleave said on January 18 at his organization’s lobby day. He noted that there are many issues that differentiate the parties; gun control shouldn’t be one of them. This is one of our oldest civil rights. It’s our heritage, and Democrats and Republicans should come together to embrace it, expand it, and protect it. The National Rifle Association's Chris Cox said, he "commends leaders in the Commonwealth for moving forward on a bipartisan package that will benefit Virginia citizens." Reversing the gutting of carry agreements in exchange for not allowing wife beaters have guns, state police at gun shows (I already see them there regardless), and prohibiting persons from obtaining permits in other states when they were originally rejected in Virginia, is a win. We should be celebrating. Herring takes high road: "I'm encouraged to finally see a bipartisan conversation about how we can reduce gun violence ..."